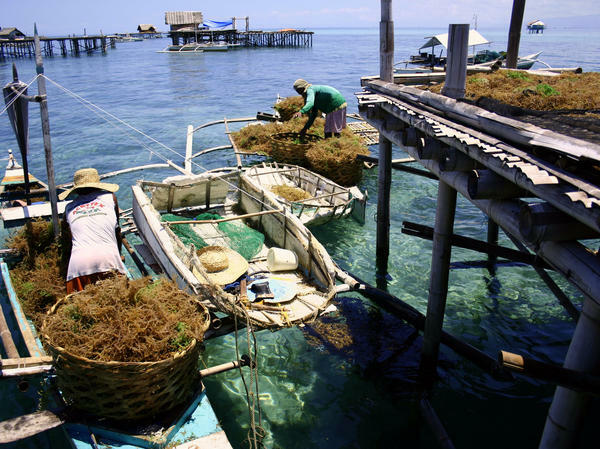 Carrageenan is an extract derived from seaweeds like these harvested off Hingutanan Island, Bien Unido, Bohol, Philippines. Carrageenan is extracted from seaweed and has a long history of use as a thickening agent in food. In foods like high-protein beverages, it helps keep the liquid smooth and well-mixed, even after days sitting on a store shelf. It helps give ice cream its distinctive mouthfeel. The debate over carrageenan has split the organics industry. Organic purists such as the Cornucopia Institute campaigned to ban it from organic food, citing scientific studies that observed intestinal problems among laboratory animals that ate the substance. Established organic food companies, on the other hand, fought to continue using it. Not only is it safe, they argued; no other natural emulsifier can take its place. The National Organic Standards Board, an advisory group drawn from various parts of the organic industry, struggled for years to reach a decision. In December 2016, it voted to drop carrageenan from the list of approved organic ingredients, after hearing evidence that alternative ingredients existed that could replace carrageenan. That vote, however, was technically a recommendation — and the U.S. Department of Agriculture, which administers the National Organic Program, has now decided to disregard it. In a statement published in the Federal Register Wednesday, the USDA says it "found sufficient evidence in public comments to the NOSB that carrageenan continues to be necessary for handling agricultural products because of the unavailability of wholly natural substitutes." Consumers Union, which opposes the use of carrageenan, attacked the decision as "another step to undermine the integrity of the USDA Organic label." It's the second time in a year that the USDA has reversed a vote by the NOSB on a high-profile issue. Last month, the Trump administration revoked animal welfare regulations the Obama administration had proposed that would have required organic farmers to give their egg-laying hens more room to roam outdoors. Unlike the ban of carrageenan, however, the animal welfare rules enjoyed solid support from almost all organic farmers and food companies. The Organic Trade Association, the main trade group representing organic food companies, has gone to court in support of the animal welfare regulations, but it has not taken a position on carrageenan. This little-known ingredient has a surprisingly long history. A couple of centuries ago, people who lived along the coast in Ireland and Brittany picked up a kind of seaweed called Irish moss and boiled it with milk, helping turn it into creamy pudding.